I’m just going to say it: May FLEW! (I know you’re thinking it, too.) I’m excited for June, I’m excited for summer (even though I’m currently melting from the heat because I’m trying to be a hero by refusing to turn on the air conditioning!) and I’m excited for the weekend. Our anniversary is Sunday and we have no solid plans for the entire weekend except for our traditional anniversary dinner at Golden Steer, Forest Park’s most famous steakhouse. Today I finished Naoto’s gift. It is imperfect, but filled with love (and a few swear words). I will share it next week. I also finally made some simple plant markers for our garden. 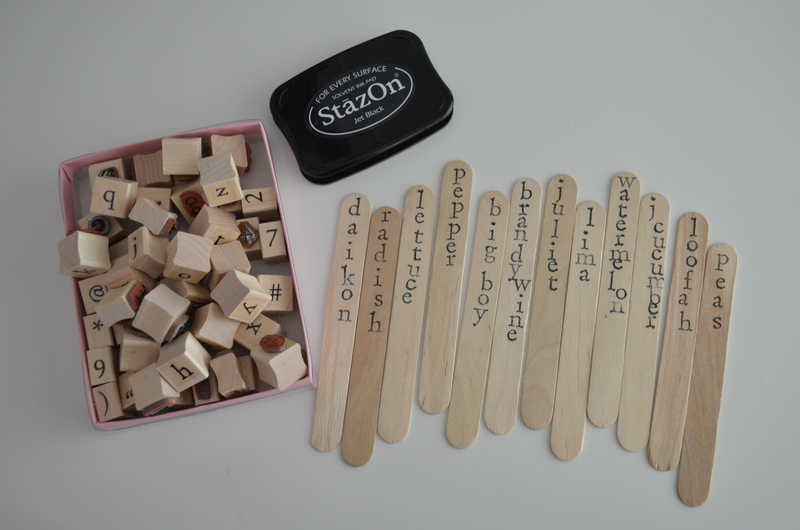 I just stamped some craft sticks with my alphabet stamps and StazOn ink. It took about five minutes (most of that time was spent searching for the elusive R stamp!) in between loads of laundry. We are going to the garden this weekend for sure (it’s been raining again, so I’m dying to see the progress and stay on top of the weed growth!) so I’ll show them “in action” next week. That’s definitely a cute idea!